Jungle Red Writers: Thanksgiving: It's all about the food! RHYS BOWEN: When I first came to America people loved to criticize and joke about British food. I agree that during the post-war period when there were still shortages that food in England was pretty grim: overcooked cabbage, gray meat, sausages that were more filler than pork. But recently, (if you exclude the numerous Pizza Huts and KFCs) the food around Britain can be wonderful. Lots of fresh local ingredients: fish, lamb, veggies and innovative ways of preparing it to bring out the natural flavor. So if anybody suggests these days that British food is dire, I suggest that perhaps they have not ventured outside their friendly neighborhood Hilton. One of these traditions won't go away as my son-in-law always requests the green bean casserole at Thanksgiving. I understand that it reminds him of his childhood and I confess it is actually the most tasty of those recipes. So being a kind person I will make it. But sorry, no sweet potatoes with marshmallows! But my family has now introduced our own sliver of British cooking to all celebrations. My mother's apple crumble! An interesting variation on pies as it includes oats and coconut. About 6 Granny Smith apples, peeled and cut into chunks. stick and half of melted butter. sprinkle apple with lemon juice, a small amount of water and a sprinkling of brown sugar and cook gently for a few minutes. mix dry ingredients then stir in melted butter. bake at 375 twenty five or thirty minutes, until topping is nicely tan. Other ingredients I add sometimes are cloves to the apple mixture, or some powdered ginger to the dry mix. AND wishing you a Happy Thanksgiving in advance! Your apple crumble sounds delicious, Rhys . . . I’m definitely stopping at the grocery store on my way home from church. Thanks for sharing the recipe . . . . Your apple crumble looks a lot like mine Rhys, I'll try to add coconut next time. Thanks for the apple crumble recipe! I will have to try it. It sounds much easier than messing with homemade pie crusts. Thank you for the apple crumble recipe, Rhys! It sounds wonderful, and the crumble topping could be adapted to so many other dishes. Definitely worth some exploration time in the kitchen! May I ask for one bit of clarification? When you say you cook the apples "gently for a few minutes" what are you cooking them in? Skillet? The casserole dish? Large pot? Baking? Frying? Microwaving? Are the water and lemon juice all you cook them in, or do you add a dab of butter? As for the green bean casserole, I know it's weird, but people do love it. I took it to a pot luck supper once, with crowd of terribly sophisticated younger co-workers who had stuck me with bringing the vegetable. I decided to do it as a joke on these young women who were always going on about their perfectly steamed asparagus spears and where they got the freshest arugula. The joke was on me, though, when I discovered the dish darn near licked clean by the time I got to the head of the serving line. We call that, minus the coconut, apple crisp, Rhys! The oats are a great addition. I still make my mother's pumpkin pie - using canned pumpkin. It comes out better than when I do all the work of baking the fresh one, scooping out the flesh, and grinding it up. Do you know, Edith, that canned pumpkin is not pumpkin as we know it but a weird variety called Dickinson pumpkin. That is why the little pie pumpkins that I've used are never as good as the ones from cans, the flavor being inconsistent on many levels. Eons ago Libby got permission to use this variety and the rest is history. British food is not bland! Roast beef, yorkshire pudding and sprouts! Ah, what a meal that is! I have British grandfathers and I love British cooking! Your apple crumble will be on my table for Thanksgiving. Thank you for the recipe. Your Apple Crumble sounds delicious, Rhys. Half my family would not eat it, though. Apparently, coconut is the devil. We never had as a tradition either the green bean casserole or the marshmallow yams. However, my mother made yummy candied yams, with lots of butter and brown sugar. Today, I enjoy sweet potatoes roasted like jacket potatoes, split open, with butter, salt and pepper, and a sprinkle of cinnamon. My newest son-in-law likes smoked macaroni and cheese, which is a huge mess to make, and has as many calories as the entire rest of the feast. I'm going to discourage that dish this year in favor of mashed potatoes as our main starch. I can't talk anyone out of stuffing, though. I had some of my best and most memorable meals in England. Sunday roast for the win! I draw the line at marshmallow/sweet potatoes, too. But I do keep a can of campbells mushroom soup around for making the mushroom scalloped potatoes I grew up with. And like Edith my pumpkin pie is much better when I use canned pumpkin and the recipe on the can which calls for evaporated milk. I'm with Karen on simply baking sweet potatoes, but hold the cinnamon on mine please. This sounds lovely, too, Hallie! 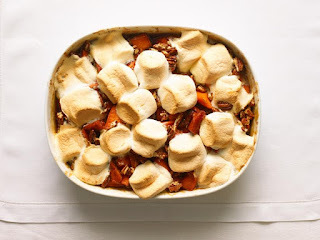 My sister's variation on the sweet potato casserole uses white sweet potatoes and a crunchy pecan topping--no one in the fam likes the version with a marshmallow topping. Slice the apples, subtract the coconut, and that's what I've been making as apple crisp as soon as the weather turned cold. Hot, bubbly, not too sweet--mm-mm! I like the sound of your sister's variation! I saw another yesterday that was loaded with Swiss cheese, leeks and heavy cream--it looked delish! I'm always shaking my head when I see or hear about marshmallows on sweet potatoes. And cool-whip - my mother wouldn't allow it in the house. Apparently our Thanksgiving dinners tended toward New England traditional. But what is it with people serving macaroni and cheese along with the turkey, dressing (stuffing) and mashed potatoes? When a friend listed what he was preparing for the day I thought he was kidding. But no, turns out a lot of people do that. I don't get it at all. Is it a cultural or geographical thing? I've not heard of the mac and cheese addition, but bring it on, I say! Never have up a topping on my mac and cheese except cheese. We don't do mac and cheese, for turkey day, either. First I heard of it was while watching cooking shows. It seemed to be an item from the southern cuisine.... at first. Maybe so, Deana. My son-in-law is from Virginia. Put me in the know marshmallows column! And no Jell-O, either. But my brother, for Thanksgiving, always insisted on black cherry Jell-O mold with black cherries in it. He demanded it! And it became a hilarious family tradition. I think the advent of the casserole came from the difficulty of having everything be done at the same time. A casserole could kind of hold, you know? So it became easier than making, say, gorgeous fresh green beans with slivered almonds and butter. Because those would have to be too last-minute. I imagine back in the dark ages when I was growing up it would be hard to find fresh green beans or almost any other vegetable in late November. Frozen ones were available but people I knew did not have large freezers, only that little compartment that was good for a couple of ice cube trays. Having just returned from England, I found the food quite good most of the time. However sauces aren't their forte. Green bean casserole has been around as long as I can remember, and it is loved by all who eat in this house. I have tried to make it using my own mushroom sauce, but it was not better than using a can of mushroom soup and a lot more fuss. What I don't get is all the criticism. If I don't like something I don't eat it. Hominy comes to mind, a staple of much southwest cuisine. And cilantro, another staple but God only knows why. However, every ethnicity, every country, every family have their own traditions, and there is nothing they are going to do differently because it isn't to my taste. I do some English things, learned from my friend Pauline, that have become an important part of our tradition: mince pies, sausage rolls, vol au vents, and for you people who hate jello, try a pink blancmange, rabbit mold, made of course from a package mix. It is disgusting to anyone over the age of five, but it is my children's most treasured memory of tea time with Auntie Paul. You are so right, Ann! When it comes to holiday feasting, most folks want the comfort food recipes of their youth. I love mince pies, and when I got the honor of bringing a dessert to my first Thanksgiving as an almost Norwood I made a lovely one, even though the ingredients weren't all that easy to find in Texas. My soon-to-be mother-in-law, who was German, rolled her eyes at it and said, "Oh, that's right. Your family is English, isn't it?" I make the little mince pies. Just one bite. Funny how people love these who would never consider eating a regular sized piece. Yum, thank you so much, Rhys! This looks delicious! Deana, my family always made two dressings, two, one with oysters and one without! But now I am the only one left who likes the oysters, so, sigh, I don't think my aunt will do two this year. And my very favorite Thanksgiving thing and the one I make no matter where we're eating, is my cranberry relish. It's from a recipe in Gourmet years and years ago and has cranberries, vinegar, jalapenos, orange rind, mustard seeds, black pepper, and honey. You just mix and cook until the cranberries start to pop. It's divine. My cranberry relish is no cook...I just grind the fruit up on Sunday or Monday and about a cup to a cup and a half of sugar. I keep in the fridge, taste it every morning and usually add a bit more sugar. Your recipe sounds great, Deborah, will need to find it. I have one with just vinegar, brown sugar and chilies, either jalapeno or just plain mild chilies. You add fresh, chopped cilantro at the end. Mom liked it on sliced sourdough baguette with cream cheese as an appetizer. No Cool Whip ever crossed the threshold in my house growing up. However, my mom did give into pressure to put the marshmallows on top of the sweet potatoes, and I think, in the long ago far away recesses of my childhood memory, there were green bean casseroles. By the time I was a teenager my mom had stopped making things with canned soups. She did, however, used canned pumpkin and evaporated milk for the pumpkin pie--it's the only way!! My sister-in-law still does green bean casserole and broccoli rice cheese casserole (with Velveeta!) which is my husband's absolute fave. I'm not contributing much this year, as we're going to my aunt's, who spends months making everything except the turkey ahead of time to keep in the freezer, but I may have to try Rhys's apple crumble. I LOVE crisps/crumbles and I say "yay!" to the coconut! No green bean casserole, Cool Whip, or marshmallows on sweet potatoes at my childhood house. Jello salads, alas, yes. Orange jello filled with carrots. It was my mother's offering to every take along which was extremely surprising because my mother truly was a gourmet cook. When I took over holiday dinners the congealed salad bit the dust. As did any recipe that had the instruction "add one can cream soup..."
Funny thing, I'm seeing more and more "one can cream soup" recipes lately. Not sure why, and I'm finding them pretty good! I added a cooked celery recipe and sauteed Brussels sprouts with bacon (sometimes pancetta if I could find it) as annual offerings. This year hubs decided to forego the turkey and asked for hot dogs with all the traditional Tday fixings. Since it will be just us, why not. Shalom Reds. Here in Doylestown, PA most of the trees have shed their leaves. The leaves still on the branches are mostly brown. We’ve had our first disrupting snow storm and Thanksgiving is upon us. Friends, who until two weeks ago, I haven’t seen in almost a decade, have invited me to dinner. Twenty-five souls have been invited. So, I don’t expect there will be any lack of food, but I don’t want to arrive empty-handed. So when I saw your mention of ‘green beans’, I said, “how hard could it be?” I don’t usually cook fancy for myself but I can follow a recipe and we live in the age of the surfeit of recipe and food blogs. On the blog called Cookin’ Chicks, I found a recipe called Bacon Wrapped Green Beans. Being a believer that anything wrapped in bacon must be scrumptious, I am off tomorrow to find that and all the rest of the needed ingredients. Have a wonderful Thanksgiving everyone! P.S. Last week I scored my very own copy of Trust Me. Our family canned soup recipe is pearl onions in a delicious wine cheese sauce. The can of mushroom soup replaces the step of making a roux. The dish also has slivered blanched almonds. A must for the holidays straight from the 1950's even in our family of excellent cooks. My mother used to make sweet potatoes mashed with some orange juice, squeezed from real oranges. This was put into the actual orange skins from the juicing and then topped with pecans and marshmallows, then heated up. Rhys, the apple crumble sounds delicious. I'll have to give it a try sometime. I say a big no to the green bean casserole, too, but I did fix it once upon a time. This year, I'll be fixing a broccoli casserole (broccoli, velveeta cheese, ritz crackers, and butter) because my nine-year-old granddaughter has requested broccoli, and the casserole usually turns out pretty yummy. A stand-by from my mother's table is the scalloped oysters I fix every Thanksgiving and Christmas, a continuing family favorite. I like to have mashed potatoes, too, but last year I tried a new recipe. It is author and friend Kristi Belcamino's mashed potatoes, which include sour cream and cream cheese, and baking them before serving. What I especially love is that you can fix it one or two days before. My family loved the recipe, so it's on the menu again this year. The dressing is problematic for me. I grew up with my mother making dressing balls, and to this day there will never be anything better to me than my mother's dressing balls warmed up in her gravy the day after Thanksgiving. I have no idea how she made enough to feed us all and have leftovers for more than one day. My brother can supposedly replicate her dressing balls to perfection. Me, not so much, so I've resorted to other means. I hate to admit it, but I will probably get my dressing from a local restaurant, along with their gravy. Oh, the sin of it all. Some years, I fix an asparagus casserole, which I love and was my mother's recipe, too. I'm toying with the idea of fixing her corn pudding, but I'm really the one who enjoys it, so I may skip it. Then there's the turkey and ham. I do miss my mother's country ham she cooked, with a ham cured by my father. Desserts can include ones from pumpkin pie (my mother-in-law's not too pumpkiny recipe), pecan pie, jam cake, or other. My daughter just called this afternoon to tell me that the younger granddaughter talked her into buying a Thanksgiving themed giant cookie dessert to bring. Oh, the cranberries my be the jellied can sort, but my mother-in-law may fix a cranberry dish. She is going to fix the macaroni-n-cheese dish, but that's because the granddaughters enjoy it so much. I could do without that additional dish. At first my mother only made candied sweet potatoes which I hated until Home Ec introduced me to the ones with marshmallows. I still bake them in the microwave but use the fluff not the individual marshmallows. I still use the cream of soups, more often as a gravy than in a casserole. What I don't eat is canned vegetables, only fresh or frozen. Canned fruits are OK, though. I never ate stuffing or gravy when I was a kid. I was kind of a minimalist then. My Dad used to mix everything together, and we went "Ugh". We found out that when you're older, it is easier to eat things moistened by sauce or gravy. I also need vegetables to balance too much rich food.